The River Tees is not actually in the Yorkshire Dales, it is in County Durham, though it once formed the border between Yorkshire and Durham. It rises on the highest of the Pennines, Cross Fell, before flowing into the impounded waters of Cow Green Reservoir, an outstanding wild trout fishery in its own right. As soon as the Rivers Tees escapes from Cow Green it cascades down the impressive Cauldron Snout waterfall. It is from the foot of Cauldron Snout that fly fishing on the River Tees starts, running for many miles downstream. There is fishing on the River Tees above Cow Green Reservoir, but it is even more inaccessible than the Tees below Cauldron Snout. It must be pointed out that from High Force Waterfall, upstream to Cauldron Snout, the upper River Tees is pretty difficult to access and involves a long hike to get to most sections. Once on the river though you are in for some outstanding fishing. The River Tees must have one of the highest populations of brown trout in the whole of the UK, not big fish, but certainly lots of them. There are grayling present in the river from just above Middleton-in-Teesdale downstream for a considerable distance. I have fished on the River Tees on many occasions, mostly fishing matches and National Rivers Finals, but over recent years I have guided there regularly, putting my match fishing experiences to good use. This intensive fishing has given me a good understanding of the river, its fish and topography. While many fly fishing techniques work well on the River Tees it is North Country Spiders and dry flies that give the most success. Get your presentation right and you will have a day to remember on the River Tees in Upper Teesdale. 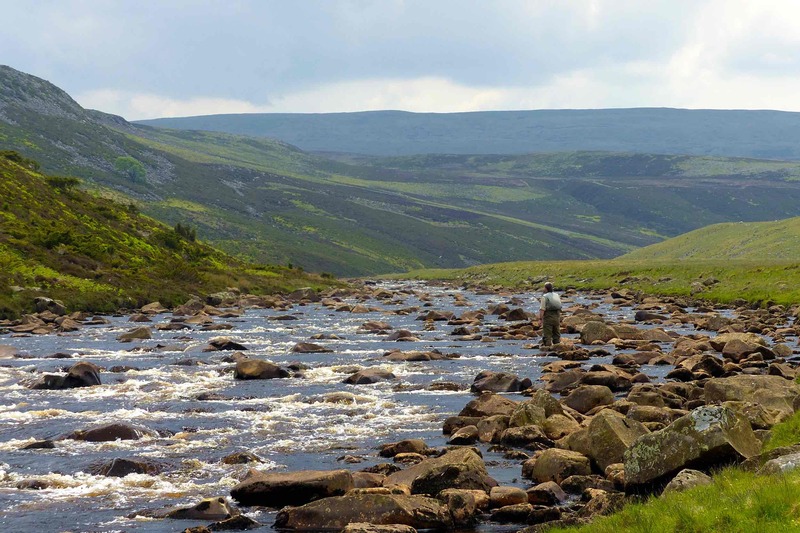 I fish the River Tees from just above Middleton-in-Teesdale to Cauldron Snout. The trout that inhabit the river are typical wild brown trout; hungry, but intolerant of a badly presented fly. Get the presentation right and you'll have trout coming to your fly all day. The River Tees will still fish well when swollen by heavy rain. Though it may appear unfishable and unattractive the fish just move to slacker water and keep coming at the fly. If things get too bad there is always Cow Green Reservoir as plan B. Day tickets for the Upper River Tees are available from various outlets in and around Middleton-in-Teesdale.